Harvard professor Thomas E. Patterson released a study of media coverage of the presidential candidates for the 2016 primary season. This review of the study will show that the media was biased in favor of Hillary Clinton and against Bernie Sanders. The numbers make a powerful case. We have since learned that bias was deliberate. Primary campaign season was dominated by horse-race “winning and losing” issues, with substantive coverage at only eleven percent. Republicans received 63% of the coverage. 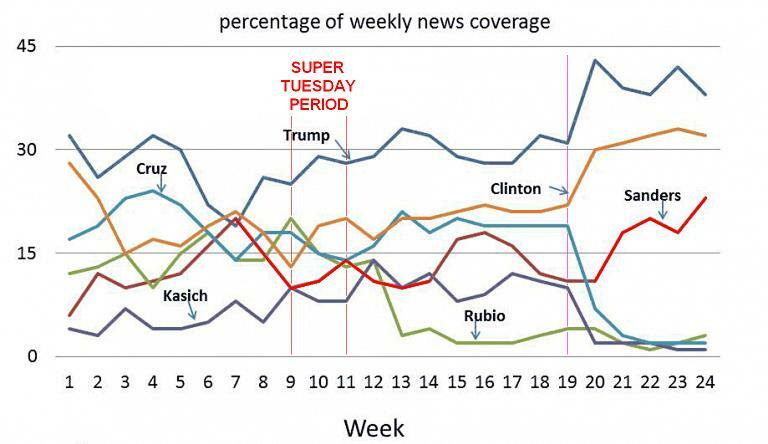 Donald Trump received the most coverage by far. On the Republican side, Donald Trump received far more coverage than his rivals. Donald Trump coverage started out 57% positive but trended downward to 39% positive at the end. Hillary Clinton received the second-most coverage. On the Democratic side, Hillary Clinton received far more coverage than Bernie Sanders. 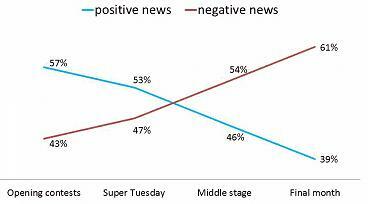 Hillary Clinton coverage started out 44% positive. After “Mini Tuesday,” Hillary Clinton coverage briefly went positive at 51%, but slipped back to 49% percent positive at the end of the season. Republican rivals received far less coverage than Donald Trump, and coverage was widely negative. Democratic rival Bernie Sanders received even less coverage than Republican rivals right through “Mini Tuesday.” However, Bernie Sanders was the only candidate from either party to receive more positive coverage than negative coverage, 54 to 46%. As shown plainly here, Donald Trump was way ahead throughout the season, leading in 23 of the 24 weeks. Hillary Clinton was way ahead of Bernie Sanders, likewise throughout the season, leading in 23 of the 24 weeks. Sanders’ coverage during the primaries was the antithesis of Trump’s. Trump got a lot of press attention. Sanders didn’t get a lot. Trump’s positive coverage was rooted in his electoral success while his negative coverage flowed from his policies and character. Sanders’ positive coverage stemmed from his policies and character while his electoral defeats and unlikely prospect of nomination accounted for the bulk of his negative coverage. Despite all of the data revelations, the report nevertheless refused to place any serious responsibility upon the journalists or the media entities. Journalists cannot be faulted for the system they are required to cover. They didn’t invent America’s marathon nominating process. But the structure of the nominating process is at odds with journalists’ norms and values. This observation is not the usual complaint that the press is obsessed with the horse race. For more than a century the press has reported on who is winning and losing. What is different is that, after the nominating process was changed in the early 1970s to require states to hold a primary or caucus, the horse race was elevated to unprecedented heights. After declaring recent changes in the primary system as the culprit, Patterson attempted to explain media bias as some sort of natural tendency. Game-centered reporting has consequences. The media’s tendency to allocate coverage based on winning and losing affects voters’ decisions. The press’s attention to early winners, and its tendency to afford them more positive coverage than their competitors, is not designed to boost their chances, but that’s a predictable effect. Patterson suggested that those who make decisions in the media and those who do the reporting either do not know of this “predictable effect,” or they would defy human nature to avoid pushing their biases onto others. Marking up the above graph figure, there appears to be more than just natural journalistic tendencies and inherent biases at work. Two things become immediately clear as highlighted in red. First, Bernie Sanders coverage dropped off during the most critical primary period, and second, despite a small bump in the “Middle Period,” coverage remained low until well after Hillary Clinton took the “presumptive nomination.” Then, coverage of Bernie Sanders inexplicably increased. We now know that this anomalous dip was no accident. As Wikileaks founder Julian Assange explained on Going Underground regarding recent DNC email leaks, Democratic National Committee (DNC) Chairwoman “Debbie Wasserman Schultz herself personally called up the president of MSNBC to apply pressure” upon the television network to favor Hillary Clinton in coverage. As a result of this discovery, Debbie Wasserman Schultz resigned her position at the DNC. Figure 11 of the report showed how the tone of coverage of Donald Trump went negative over time. Curiously, no graph of tone was produced for other candidates. 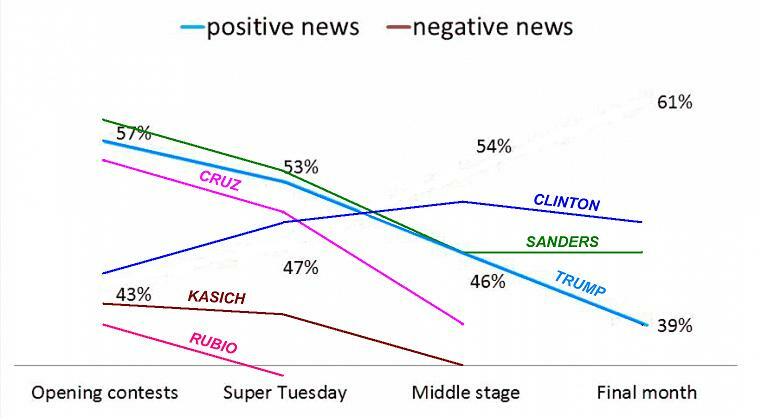 Below, the tone of coverage for each the major candidates is graphed to display an interesting result. Here are all candidates and positive coverage only. 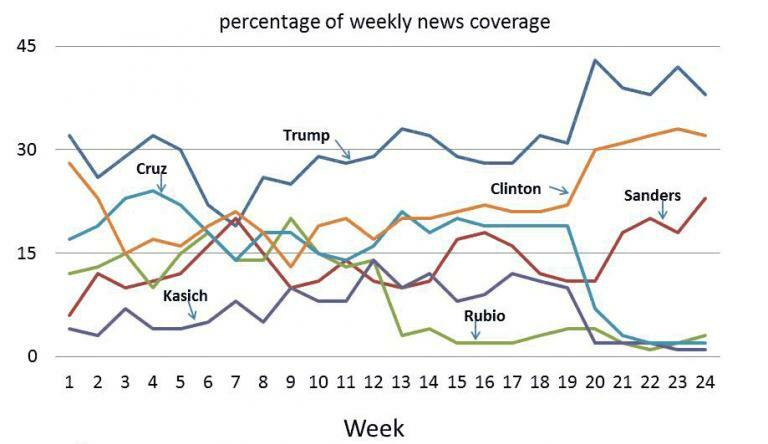 Tone of coverage went increasingly negative for all candidates over time except Hillary Clinton. The tone of coverage for Hillary Clinton went net positive for only one period — the critical period where Bernie Sanders could have won the contest — the same period where coverage of Bernie Sanders went negative. Again, this was no accident. Although Trump no longer had active opposition, he received more news coverage in the last month than did either Clinton or Sanders, a development that has no possible explanation other than journalistic bias. Reporters are attracted to the new, the unusual, the sensational, the outrageous—the type of story material that can catch and hold an audience’s attention. But he never noticed the favorable bias toward Hillary Clinton, and the conveniently-timed bias against Bernie Sanders. After the DNC leaks, we know it happened and we know it was deliberate. Analysis of the statistical evidence should have pointed in that direction — and it did.